Capturing high-definition video is a challenge for any project, but a great way to see where you're project has been, especially if it's something like an autonomous robot or a high-altitude balloon. The downside is that traditional video cameras can be heavy, difficult to mount, and triggering them to record can require some hacking. So why not use a video camera that was *designed *for hacking? The HackHD is a bare-bones camera that records 1080P video at 30 frames-per-second. Just attach a 3.7V Li-Po battery or other 3.7V source and a pushbutton and you have a fully functional camcorder. Because recording is triggered with a simple button-press, it can easily be controlled using a microcontroller or simple sensor. Video is recorded onto a microSD card (not included) and the HackHD supports cards up to 32GB. The HackHD also has a composite video output which can be viewed while it's recording as well as an external audio input which overrides the on-board microphone when used. An LED can be attached to the LED output as an indicator of the camera's status. Note: To save you a few bucks, we're selling just the camera by itself. The included instruction manual mentions a battery holder, pushbutton, LED, SD card, etc. but they are not included. You probably have those things laying around, why pay twice? I finally got a chance to play with this camera a bit. So far I like it a lot. I've recorded video using both a Class 6 and a Class 2 microSD card. I was surprised to see the Class 2 card seemed to work just fine. The recordings are about 100MB per minute. A two minute nine second video generated a file of 199,915KB. I don't have many single cell LiPos so I used the charge jack on a two cell LiPo to tap into a single cell. I just stuck the leads of an LED into the "LED" and ground pins and the LED worked fine. I connected the video out and ground to an RCA connector and viewed the video as it was recording on a NTSC monitor. I didn't connect a button to the camera, I just used a wire on the "button" pin and touched the wire to ground to start and stop the recording. It would be easy to use a microcontroller to turn the camera on and off by setting an I/O pin to output and setting the pin low for a fraction of a second to act as a button. I'd suggest making the pin an input during the times the you don't want the button to seem pressed. You could also have the microcontroller monitor the LED pin to make sure the camera really is recording when it should be. 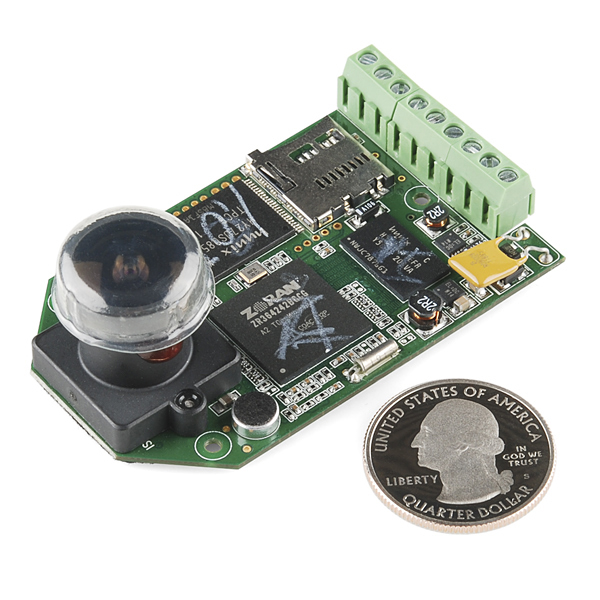 This camera should be very easy to control with a microcontroller. I want to see if I can have the microcontroller tap into the SD card pins and delete unwanted files so this could be used to to continually monitor a location with old files being deleted and only keeping files after some trigger event has occurred. (I want to be able to keep video from just before the trigger event.) There are five holes above the SD card that I bet will make this easier. Edit: It looks like I was wrong about the five holes above the SD card holder. They don't appear to be connected to the SD socket. I may need to use a microSD card sniffer to access the card with a microcontroller. Edit(9/2/12): I flew this camera with my quadcopter today. It took amazing looking video. I had no idea it would look so clear. I made a DIY enclosure out of some plastic sheet with a Plexiglass front panel. I used cable ties to attach this to my quadcopter and it worked pretty well. One problem I hadn't anticipated was the edge of the enclosure was visible since the lens has such a wide angle. I'll need to redesign my enclosure to keep the edge out of the picture. I measured the current this camera uses. With a 4.0V supply, it draws about 600mA of current. It fluctuates between about 560mA and 600mA (this was in "automode"). I noticed the part of the fluctuation is caused by the LED flashing. My first flight with the camera lasted long enough for the cell powering the camera to get low enough to trigger the camera's automatic shutdown feature. I think this feature is a nice addition since if a file isn't closed correctly, it will become corrupted. Here's the YouTube link to the video. Edit(9/4/12): I've added the raw 0.5Gig file to my public DropBox folder. The raw video isn't edited so there's a lot of video watching the grass grow in it. The actual flight starts at 1:20 and ends at 5:21. I doubt I'll keep this raw footage available for very long. I'll try to post a better video soon. Edit(9/4/12): My HackHD weighs 32.03g. While I've used the camera with Class 2 and Class 6 SD cards (I didn't notice any problems using slower cards), the video I linked to above was recorded with a Class 10 card. I used 2M metric hardware to mount it (the holes are too small to use 2-56 hardware). The single mounting hole next to the screw terminals doesn't have as much clearance as the two mounting holes near the lens. A 2M nut wouldn't fit on the 2M bolt on front of the board since the screw terminals are so close to the hole. Edit(9/10/12): I have a microSD sniffer, I plan to use with a Propeller chip to come up with some way of using this camera as a continuous recorder. I'll have the Propeller keep track of the files and delete old files that are not deemed significant (based on some event such as a button press). Thank you very much for the best information! This is really great information; everything I was looking for from an unbiased source. Really appreciate it! I'm glad you found the information helpful. I'd be inclined to use a GoPro over the HackHD unless there's a feature of the HackHD you need/want. The HackHD does have a few advantages over the GoPro such as low light quality. I the HackHD is probably easier to interface with a microcontroller than a GoPro but I don't think using a GoPro would be too hard (I haven't done this yet myself). I'm pretty sure the lens of the GoPro is higher quality than the HackHD lens. The HackHD lens is easy to change. How was your progress using the SD Sniffer to manipulate files on the SD card after they had been written by the Hack HD? I haven't made much progress. I damaged the SD socket on the camera. I tried replacing the socket with a breakout board using short wires back to the camera PCB. The camera wouldn't work with an external SD card socket. I need to replace the damaged socket before I can continue the experiment. I have an extra socket on hand. I just haven't spent the time needed to replace it. Dave, This is too cool! I look forward to seeing the video. What voltage did you use when you measured the current draw? As I've noted in my comments, the current draw topped out at about 600mA at 4.0V. Did you have a LED connected during your measurements? I thought the "bounce" in current corresponded with the LED blinking. I hope you post additional information about your flight. I'd really like to do something like this some time. Very, very cool video. I look forward to reading about the rest of your payload. I'm not sure how well the C2 and C5 cards worked. I didn't notice any problems but I only made a couple of short test videos. I'm using C10 cards with my quadcopter flights. Imaging/video is one of the most frustrating markets to work with in the electronics industry. Do you want to use a camera cube? get out the team of lawyers. Do you want to use a nice omnivision chip that takes a standard camera parallel output and turns it into a jpeg? better have the same team of lawyers ready. 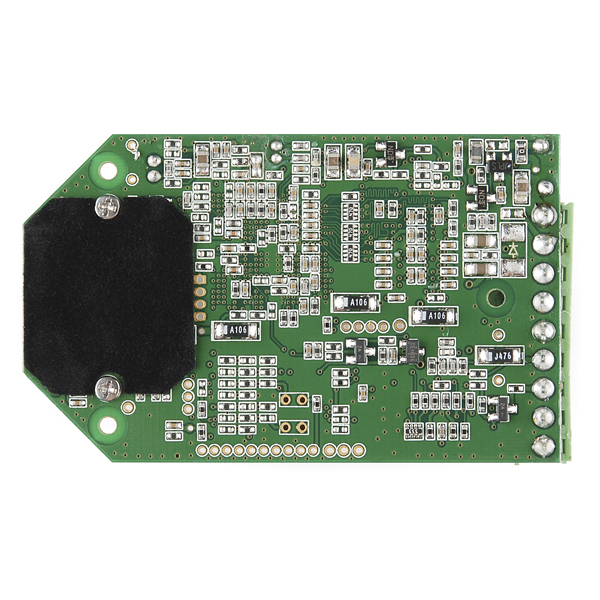 Or what about any of TI's, Analog's, or NXP's SOCs that you can simply plug CCDs or CMOS sensors into and have a complete system? maybe a slightly smaller team of lawyers. This system is no different. The Zoran chip seems to have been re-branded by CSR and is just another chip who's datasheet you will never see. Who ever built this board must have an in with the industry, because if they built this without permission, then they better have those lawyers ready. That being said, this looks like a wonderfully easy product to use, and I hope it finds its way into many peoples HABs, rockets, helmets or anything else really. Are you referring to MPEG licenses? Wouldn't have Zoran paid that and included it in the price for the chip? Does the HackHD take photos? No, we opted out of having a photo option in order to keep things simple. Bummer. That's a deal breaker for me. ** UPDATE: ** HackHD posted new firmware this week that allows for still image capture in either 9 or 5 megapixel format. I've tested it and it works as expected. Could you provide a littler more elaboration on how you used the still image mode? Could this be controlled by a micro-controller completely bypassing the streaming feature? I would like to use as a still cam and then pull the images off of the sd card with the micro-controller as well. Are there any other I/O options other than the video out? Sure. You edit the configuration file on the SD card to set how you want to control the camera. You have two shooting options. 1) trigger the camera to take a photo every n seconds via the PHOTO_INTERVAL parameter in the config file, or 2) set that param to 0 and use the microcontroller to trigger the button. Using the latter technique, you need to put the camera into standby mode while you power it up, which can also be done by the controller. In both modes, the images are stored directly onto the SD card. No streaming is involved. I'm currently using a HackHD, GPS module, and Arduino Uno to map bike trails. Works great as a poor man's google streets. Details of the config are here: http://www.hackhd.com/downloads/hackhd-v115-instructions.pdf and they also have some videos showing the timing necessary to put the camera into different modes. Thank you greatly for you information. I found the config file after a little further inspection of the resources. I have a few questions about your project that you are using the HackHD for. I am assuming you are tagging the photos with the gps location based on timesteps or by editing the metadata of the image. What format is the image taken in? Also, are you able to access the sd card using the Arduino Uno without removal from the HackHD. I have a feeling I may need to device a workaround to get at the SD card lines in order to read to my microcontroller for some manipulation over SPI. Lastly, anyone know of a 360 degree option for the lens? Images are JPEG. There is no (documented) external access to the SD card. In fact, the only digital communication at all with the camera is via PIN3, which is simply the power/shutter button. You may be able to hack the board to access the card directly, but that would entail a lot of tracing and trial and error since the schematic is not available -- this is not an OSHW device. (I wish it was, it might get more community support.) However, I found them very responsive to questions. What come out the video out pin? analog NTSC maybe??? What voltage levels in the audio? What voltage level on other inputs (besides power)? Not much here for a hardware hacker to hook a micro controller up to. Good description on how not to break it, just not very much on how to use it. I just tried mine out with a NTSC monitor and it worked fine. I'd be very surprised if the video out pin isn't NTSC. I should receive one by Tuesday and I'll let you know for sure. The button pin can be controlled by a microcontroller by connecting it to an I/O pin set as an input. Whenever you want the uC to "press" the button set the I/O pin low and an output for the appropriate amount of time and then return the I/O pin to an input state. The uC can monitor the LED pin to determine which mode the camera is in. I realize I never updated this post about the video. It is NTSC. Excellent timing! I was thinking of buying an off-shelf camera to bring along to OHS and MF:NYC next month; buying this one instead. There's a firmware update for the HackHD camera so that it can also pictures/photos/images => http://www.hackhd.com/firmware.php. This camera looks interesting... but I want to ask first a question: can I use it to monitor something, i.e. without recording and without SD card (the user manual says 'no', but...)? Thanks! Try this list of camera modules. This seems very similar to the "dashcams" that are popping up everywhere, but they include an LCD for viewing the video. And all for around $50! Has anybody tried hacking one of these dashcams? We actually set one up in our RV for the National Tour. Worked pretty well minus the bumps wiggling bits loose. For anyone who's interested, I made a laser cut acrylic case for mine and uploaded the design to Dropbox. Not waterproof or anything fancy, it just made it easier for me to mount on things (I use it for time-lapse videos mostly). It's a stack-up of 5 layers. In the DXF file, the two mostly solid pieces on the right are the top and bottom, thickness can be whatever you want, I used 2 mm plexiglas. The pieces on the left are 3 mm plexiglas. Cut green first, red second and blue last. It should be fairly self-evident how to assemble, but a couple things are tricky. Start with the base, put three 2-56 5/16 inch screws in the holes that will line up with the holes on the HackHD board. On top of the base, place the piece with the full HackHD outlined hole. Next position the HackHD camera. I found the holes to be pretty tight. Put nuts on the screws and gently tighten. I had to grind one side of the nut next to the connector to fit. Next the similar piece that doesn't have the hexagonal holes, and finally the top. Insert three 5/8 inch 2-56 screws in the other 2 mm diameter holes from the rear and gently tighten with nuts. The remaining piece can fit over the screw heads on the back, and with a couple of 3 mm screws of appropriate length the assemble can be mounted on a bracket or what have you. The spacing of these screws is 40 mm. I am using the arduino PWM pin 3 output as a power source for the camera. An analogWrite of 450 gives me about 3.8V. Unfortunately there's no way an Arduino pin can provide the large amount of current required by the camera. A dedicated LiPo battery of 1000 mAh or above is a good option. You are correct. I tested without SD card and the led was working... But for the real work more power is needed. Now i use my 5V pin and hope the device does not burn. Is there a way to write extra info on JPEG metadata from outside source in real time ? Take serial from lets say GPS or micro controller trigger camera externally and embed extra info to JPEG file. For connection to a processor (Yun, Teensy, Uno, etc...) the long button presses to get this thing on/ off / standby is a bit onerous. And monitoring the LED status pin to see what mode it is in is also painful since it can be blinking and you would have to monitor it for a period of time and decode it to tell what is really going on. Ug!...Has anyone implemented an interface library that is non-blocking to handle such tasks? I just hate to re-invent the wheel. Thanks! Is it possible to power the HackHD camera by an Arduino Uno? The manufacturer's website talks about a range from 3.7v upto 5.5v. However, no clear answers..
Hello everyone. Hoping someone can point me in the right direction. I'm looking into ordering three of these but not sure I can get them to just shoot stills. Does anyone know if this is possible? And if not, is there a similar camera which will just shoot a still picture? Thanks for the help! Almost what I was looking for but no easy way to make it work for me... if only there was a version that didn't have the camera attached to the board, a cable like the FlyCamOne would be nice. I'm working on a design that is a little to space constrained to use this, so I'm back to looking at things like keychain cams because the rest of the components are behind rather than next to the camera. Has anyone had a problem running the camera with 5 volts? Anybody attempt a 360 degree implementation yet? I would like to attach a 360 degree mirrored lens to it. Hasn't this been rendered obsolete by the RaspberryPi + it's camera? I mean the specs are about the same. Thoughts? There are more to specs than pixel count. I don't know how all the spec compare but I'm pretty sure it's much easier to use the HackHD with a microcontroller than setting up a RPi with its camera to use as a camera. The RPi/camera combo isn't going to be as easy to mount in a robot. It's great to have another camera option but I don't think one of the two options you mention is a clear winning for all possible applications. Looks like a great camera :) just a quick question i know the removing the IR filter will make it be able to be modified to become a night camera. My question is can it be possible to make it both a day and night camera? Anybody have any luck using this with a microSDHC card? That's all that they had left at the local Phone Booth, no microSD or microSDXC. After about 10 seconds of recording the damn thing stops and its LED starts frantically blinking. It saves 11 MB or so to the card and shuts off. I tried updating the firmware to the one that's supposed to work with microSDXC cards, but it still only records in 10 second spurts. Works now. Turns out that it was the power supply. When I moved it off batteries and onto a bench supply, all was well. Guess a manual update wouldn't hurt to mention that the blinking is also caused by power issues and not just missing or corrupt cards. The composite output view is active while recording, and there is an on-screen display of the number of minutes:seconds that have been recorded. I have very tight space and need to disconnect the camera from the circuit, and reconnect it using a wire soldered to the camera on one side and to the circuit on the other. This way I can put the camera in a little hole and place the rest of the circuit a little further away. Anyone know how complicated that should be? Has anybody been able to tap into the HACKHD to obtain the video output without it displaying the firmware version? I am trying to use this camera on my quad with an OSD (On screen display) and the video output is coming through some sort of onboard OSD that is conflicting with my external OSD. It would be awesome if there was some sort of way to disable it. any idea's? I am halfway through a Kickstarter project called Hackacam. It is a programmable HD network camera module for hackers. It does 1080p30 H.264 video encode, support swappable lens, and have network interface build right on to the module. If that sounds interesting to you, please take a look! "To save you a few bucks, we're selling just the camera by itself". I can get the one with accessories for $175 with free shipping from the manufacturers site. I can get the barebones one here for $160 and pay $15-30 for shipping (as estimated by the shipping calculator). Doesn't really make sense to order here unless its part of a larger order that's sharing the shipping cost. This is so close to what I have been looking for for a long long time but alas it is not, if it had an external trigger per frame or better some way to sync any number of cameras it opens a world of computer vision possibilities. For instance you could easily use OpenCV to stitch the frames together, or do post depth processing. Also I seem to be missing something Hack as in Hackable? Where is the interface? Buying this will save me some time hacking an AdvoCam HD2... Ouch!! Already "out of stock"! Does anyone know which CMOS camera sensor is used? This is just what I have been looking for ages, what kind of wireless video transmitter/receiver do you suggest? Any idea of when the stock will be back? Perhaps I missed it somewhere but, which way does the PCB orientate for normal (landscape) video recording? Is it with the lens at one side (i.e. landscape mount) or top/bottom (portrait)? NOT OPEN SOURCE?? 160$ WTF NOT GOOD DEAL. $160??? Come on! What's really the cost here? And please don't start comparing to GoPro's price, it just proves my point even further. Edit: Also, why make me pay for the lens, especially a fish-eye one? What point are you making exactly? The wide angle lens is what you're paying for, but otherwise, it's hard to imagine this being more practical than taking apart keychain cam. Wasn't there a more informative video than the underside of a skateboard? I was personally -really- impressed by the skateboard video. Look at how it handles the different lighting conditions in the same frame. When aimed directly at the sun, it doesn't crush everything else to black, and during the rolling scenes, there's still excellent definition in the shadows below the skateboard. This thing has amazing dynamic range. You know of a keychain cam with 1080p? But you would have to breakout the switches and no video output. There is also the 808 #16 with only 720p but with video output. It seems like the 808 #16 is better all around. It looks on the website like they were able to mount a different lens http://www.hackhd.com/images/hackhd-3lg.jpg Any info about that? This would be one of the most promising features. Anybody else have any experiences changing out the lenses? Really interested in this capability. I'm also interested in hackable firmware; I basically want a looping recorder that will stop looping on a button press, but continue recording up to the current position in the "loop" minus a pre-configured or entered time. E.g., if the "loop" was 15 minutes it would continuously record. If the button was pressed 10 minutes through and the offset was 5 minutes, it would continue to record until the first 5 minutes of the loop was re-reached. Not a good explanation. Basically "save from button_press_time - configured_save_length until out_of_space", where "space" is a loop of either pre-configured size, or the size of the SD card. That's great; thanks for pursuing this--mine was also for use in car/motorcycle. Awesome idea! Any chance though that there will be open source firmware for it? One thing that always bugged me about commercial cameras is the fairly limited bitrate, leading to motion artifacts in 1080p, effectively reducing the quality to SD... The GoPro actually delivers better video at 720p than 1080p, as it uses 15 Mbit/sec for each (which is twice as much than most other "HD" pocket cameras around...) I once compared a nice triple CCD standard definition Sony camera with a "HD" pocket camera, also from sony - the 756x578 SD footage looked sharper than the "HD", recorded at 7 Mbit/sec. The HD live-output of the pocket cam looked much better though, it's really down to the compression. For comparison, the Canon 5D II records at 50 Mbit/sec - which in professional circles is still considered low for 1080p... For fast-moving video (e.g. model planes) I'd actually prefer a high-bitrate MPEG, as it doesn't have any motion artifacts. At 50Mbit/sec there's not much of a difference in quality between h264 and MPEG, and the latter is more consistent. You'll never see open firmware. See licensing nightmare rant above. My experience is similar. Imaging technology is so locked down that it's basically impossible to do anything outside of going to Best Buy and buying a camera. Plan works perfectly. "The HackHD also has a composite video output which can be viewed while it's recording" Is that what your after? Nope, I'm after the compressed video data that is being piped to the SD card. Any luck with intercepting the data? Based on the data sheet, it saves the video if it approaches the 4GB limit for a FAT32 formatted card (required), and continues recording to prevent loss, which they claim is about 45 minutes worth at that point. That works out to about 91mb/min. That's going to require some compression when posting the video anywhere. I really doubt the camera stores 4GB at a time internally. I think the 4GB limit indicates how frequently the camera closes the file it's writing to. If a file isn't closed appropriately the file will be corrupted. I'm pretty sure the camera continuously writes to the SD card whenever it is recording. yes, this is VERY common. When you upload to youtube, vimeo, etc, they all do compression as part of the upload process. You can download apps that allow you to compress and upload in one step. compressing video after the fact is much better than compressing it on the fly which really degrades the video. On that note, could you upload some small raw video file for download? It's tricky to judge the video quality from a youtube video that's been recompressed to half the bitrate... from what I can tell, the lens seems to be focused a bit short (1-2m), so the picture seems a bit blurry -but it would be good to see the original file as it comes out. Do you know what the recording bitrate is? hum, good points. I'll get on that. check back early next week. Might be a good FPV camera. nah, if you want a gopro, the extra money for the case and buttons and such is worth it. but a hackable/embeddable gopro, yes. gopros good for extreme sports and underwater stuff, this thing is good for custom applications and mounting options, like instead of putting a gopro on your cars windscreen, you can mount one of these directly to your front bumper or dashboard, especially good for security. Is there anyway to record metadata with the video, except hacking into the audio stream? It would be great to pair this up with a datalogger, but at least you need to input timestamps into the video stream to sync it up on post processing with the data stream.